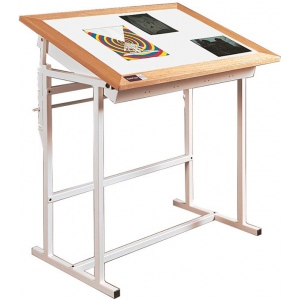 * A sturdy tracing unit trimmed in solid oak and mounted on a white enamel base. * Top has tilt-angle adjustment from 0° to 40° every 10°. * Units come with Plexiglas work surface and 5000K daylight lamps. * All models ship without glass. * Detailed instructions are included if glass is necessary.